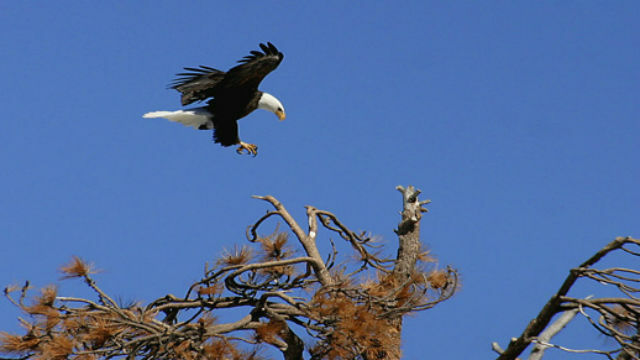 Outdoor enthusiasts and nature lovers who want to help track the number of bald eagles that settle in the San Bernardino and San Jacinto mountains this winter are invited to take part in the U.S. Forest Service‘s 39th annual eagle count. The Forest Service’s winter census is slated to begin Dec. 10 and continue on sporadic weekends through the first half of March. Volunteers are needed to watch for activity in traditional nesting areas around Big Bear Lake, Lake Arrowhead, Lake Gregory, Lake Hemet, Lake Perris and Silverwood Lake. Participants need no prior experience — just warm clothes, a pair of binoculars and an hour to spare for each count, according to agency spokesman Gregg Goodland. He said that each eagle count will be preceded by a brief orientation meeting at designated locations. Eagles generally nest in the lakeside areas from late November to early April. Radio tracking devices attached to some birds show that, in a given year, they can migrate to the Inland Empire from as far north as Alberta, Canada. Because of hunting and habitat destruction, the American bald eagle was nearly driven to extinction in the past century. The birds were declared endangered in the 1970s. However, with some 10,000 breeding pairs identified across the continental United States, they were removed from the Endangered Species List in 2007. Anyone interested in volunteering for the eagle count at Lake Hemet is asked to call (909) 382-2935; at Lake Perris, (951) 940-5600; Big Bear Lake or Lakes Arrowhead and Gregory, (909) 382-2832; and Silverwood Lake, (760) 389- 2303. Rangers noted that eagle counts will be canceled during inclement weather. More information is available at www.fs.usda.gov/sbnf.